គាត់បានសិក្សាលើគម្រោងបង្កើតថ្មី ប្រកបដោយភាពច្នៃប្រឌិត ក្នុងនោះមានដូចជា៖ អគារការិយាល័យ, វិហារសាសនា (គ្រីស្ទ), សាលារៀន, អគារខ្ពស់ៗ, សណ្ឋាគារ និងសារៈមន្ទីរជាដើម។ គាត់តែងតែឌីហ្សាញផ្នែកខាងដើមនៃអគាររបស់គាត់ជានិច្ច ដូចជា៖ គ្រឿងសង្ហារឹម និង stained glass។ គាត់ក៏បានសរសេរសៀវភៅ២០ក្បាលដែរ និងមានអត្ថបទជាច្រើនផ្សេងទៀត ហើយក៏ជាសាស្ត្រាចារ្យដ៏ល្បីឈ្មោះនៅ សហរដ្ឋអាេមរិច និងអឺរ៉ុបដែរ។ ជីវិតរបស់គាត់ គឺពោរពេញដោយភាពស្រស់ស្រាយ និងអ្វីដែលគួរឲ្យចាប់អារម្មណ៍គឺត្រង់ អគ្គីភ័យឆ្នាំ១៩១៤ និងឃាតកម្មនៅក្នុង Taliesin studio របស់គាត់ជាដើម។ ភាពល្បីរន្ទឺនៃកេរ្ត៏ឈ្មោះ នៅក្នុងជីវិតរបស់គាត់ គឺកាលពីឆ្នាំ១៩៩១ នៅពេល វិទ្យាស្ថានស្ថាបត្យករអាមេរិច American Institute of Architects បានទទួលស្គាល់ថាគាត់ជា ស្ថាបត្យករអាមេរិចអស្ចារ្យជាងគេគ្រប់ជំនាន់ "the greatest American architect of all time". 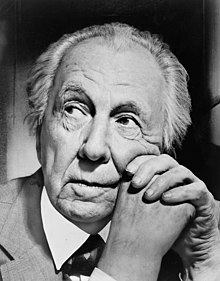 Frank Lloyd Wright was born Frank Lincoln Wright in the farming town of Richland Center, Wisconsin, United States, in 1867. His father, William Carey Wright (1825–1904), was a locally admired orator, music teacher, occasional lawyer, and itinerant minister. William Wright met and married Anna Lloyd Jones (1838/39 – 1923), a county school teacher, the previous year when he was employed as the superintendent of schools for Richland County. Originally from Massachusetts, William Wright had been a Baptist minister, but he later joined his wife's family in the Unitarian faith. Anna was a member of the large, prosperous and well-known Lloyd Jones family of Unitarians, who had emigrated from Wales to Spring Green, Wisconsin. One of Anna's brothers was Jenkin Lloyd Jones, who would become an important figure in the spread of the Unitarian faith in the Western United States. Both of Wright's parents were strong-willed individuals with idiosyncratic interests that they passed on to him. According to his biography, his mother declared when she was expecting that her first child would grow up to build beautiful buildings. She decorated his nursery with engravings of English cathedrals torn from a periodical to encourage the infant's ambition. The family moved to Weymouth, Massachusetts, in 1870 for William to minister a small congregation. In 1876, Anna visited the Centennial Exhibition in Philadelphia and saw an exhibit of educational blocks created by Friedrich Wilhelm August Fröbel. The blocks, known as Froebel Gifts, were the foundation of his innovative kindergarten curriculum. A trained teacher, Anna was excited by the program and bought a set of blocks for her family. Young Wright spent much time playing with the blocks. These were geometrically shaped and could be assembled in various combinations to form three-dimensional compositions. This is how Wright described, in his autobiography, the influence of these exercises on his approach to design: "For several years I sat at the little Kindergarten table-top ... and played ... with the cube, the sphere and the triangle—these smooth wooden maple blocks ... All are in my fingers to this day ..." Many of Wright's buildings are notable for their geometrical clarity. The Wright family struggled financially in Weymouth and returned to Spring Green, Wisconsin, where the supportive Lloyd Jones clan could help William find employment. They settled in Madison, where William taught music lessons and served as the secretary to the newly formed Unitarian society. Although William was a distant parent, he shared his love of music, especially the works of Johann Sebastian Bach, with his children. Soon after Wright turned 14, his parents separated. Anna had been unhappy for some time with William's inability to provide for his family and asked him to leave. The divorce was finalized in 1885 after William sued Anna for lack of physical affection. William left Wisconsin after the divorce and Wright claimed he never saw his father again. At this time he changed his middle name from Lincoln to Lloyd in honor of his mother's family, the Lloyd Joneses. As the only male left in the family, Wright assumed financial responsibility for his mother and two sisters. Wright attended Madison High School, but there is no evidence he ever graduated. He was admitted to the University of Wisconsin–Madison as a special student in 1886. There he joined Phi Delta Theta fraternity, took classes part-time for two semesters, and worked with a professor of civil engineering, Allan D. Conover. . In 1887, Wright left the school without taking a degree (although he was granted an honorary Doctorate of Fine Arts from the University in 1955) and arrived in Chicago in search of employment. As a result of the devastating Great Chicago Fire of 1871 and recent population boom, new development was plentiful in the city. He later recalled that his first impressions of Chicago were that of grimy neighborhoods, crowded streets, and disappointing architecture, yet he was determined to find work. Within days, and after interviews with several prominent firms, he was hired as a draftsman with the architectural firm of Joseph Lyman Silsbee. Wright previously collaborated with Silsbee—accredited as the draftsman and the construction supervisor—on the 1886 Unity Chapel for Wright's family in Spring Green, Wisconsin. While with the firm, he also worked on two other family projects: All Souls Church in Chicago for his uncle, Jenkin Lloyd Jones, and the Hillside Home School I in Spring Green for two of his aunts. Other draftsmen who worked for Silsbee in 1887 included future architects Cecil Corwin, George W. Maher, and George G. Elmslie. Wright soon befriended Corwin, with whom he lived until he found a permanent home. 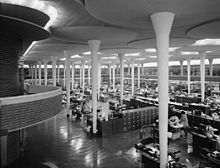 In his autobiography, Wright recounts that he also had a short stint in another Chicago architecture office. Feeling that he was underpaid for the quality of his work for Silsbee (at $8 a week), the young draftsman quit and found work as a designer at the firm of Beers, Clay, and Dutton. However, Wright soon realized that he was not ready to handle building design by himself; he left his new job to return to Joseph Silsbee—this time with a raise in salary. Although Silsbee adhered mainly to Victorian and revivalist architecture, Wright found his work to be more "gracefully picturesque" than the other "brutalities" of the period. Still, Wright aspired for more progressive work. After less than a year had passed in Silsbee's office, Wright learned that the Chicago firm of Adler & Sullivan was "looking for someone to make the finish drawings for the interior of the Auditorium Building". Wright demonstrated that he was a competent impressionist of Louis Sullivan's ornamental designs and two short interviews later, was an official apprentice in the firm. Wright did not get along well with Sullivan's other draftsmen; he wrote that several violent altercations occurred between them during the first years of his apprenticeship. For that matter, Sullivan showed very little respect for his employees as well. In spite of this, "Sullivan took [Wright] under his wing and gave him great design responsibility." As an act of respect, Wright would later refer to Sullivan as Lieber Meister (German for "Dear Master"). He also formed a bond with office foreman Paul Mueller. Wright would later engage Mueller to build several of his public and commercial buildings between 1903 and 1923. On June 1, 1889, Wright married his first wife, Catherine Lee "Kitty" Tobin (1871–1959). The two had met around a year earlier during activities at All Souls Church. Sullivan did his part to facilitate the financial success of the young couple by granting Wright a five-year employment contract. Wright made one more request: "Mr. Sullivan, if you want me to work for you as long as five years, couldn't you lend me enough money to build a little house?" With Sullivan's $5,000 loan, Wright purchased a lot at the corner of Chicago and Forest Avenues in the suburb of Oak Park. The existing Gothic Revival house was given to his mother, while a compact Shingle style house was built alongside for Wright and Catherine. According to an 1890 diagram of the firm's new, 17th floor space atop the Auditorium Building, Wright soon earned a private office next to Sullivan's own. However, that office was actually shared with friend and draftsman George Elmslie, who was hired by Sullivan at Wright's request. Wright had risen to head draftsman and handled all residential design work in the office. As a general rule, Adler & Sullivan did not design or build houses, but they obliged when asked by the clients of their important commercial projects. Wright was occupied by the firm's major commissions during office hours, so house designs were relegated to evening and weekend overtime hours at his home studio. He would later claim total responsibility for the design of these houses, but careful inspection of their architectural style and accounts from historian Robert Twombly suggest that it was Sullivan who dictated the overall form and motifs of the residential works; Wright's design duties were often reduced to detailing the projects from Sullivan's sketches. During this time, Wright worked on Sullivan's bungalow (1890) and the James A. Charnley bungalow (1890) both in Ocean Springs, Mississippi, the Berry-MacHarg House (1891) and Louis Sullivan's House (1892) both in Chicago, and the most noted 1891 James A. Charnley House also in Chicago. Of the five collaborations, only the two commissions for the Charnley family still stand. Despite Sullivan's loan and overtime salary, Wright was constantly short on funds. Wright admitted that his poor finances were likely due to his expensive tastes in wardrobe and vehicles, and the extra luxuries he designed into his house. To supplement his income and repay his debts, Wright accepted independent commissions for at least nine houses. These "bootlegged" houses, as he later called them, were conservatively designed in variations of the fashionable Queen Anne and Colonial Revival styles. Nevertheless, unlike the prevailing architecture of the period, each house emphasized simple geometric massing and contained features such as bands of horizontal windows, occasional cantilevers, and open floor plans which would become hallmarks of his later work. Eight of these early houses remain today including the Thomas Gale, Robert P. Parker House, George Blossom, and Walter Gale houses. As with the residential projects for Adler & Sullivan, he designed his bootleg houses on his own time. Sullivan knew nothing of the independent works until 1893, when he recognized that one of the houses was unmistakably a Frank Lloyd Wright design. This particular house, built for Allison Harlan, was only blocks away from Sullivan's townhouse in the Chicago community of Kenwood. Aside from the location, the geometric purity of the composition and balcony tracery in the same style as the Charnley House likely gave away Wright's involvement. Since Wright's five-year contract forbade any outside work, the incident led to his departure from Sullivan's firm. A variety of stories recount the break in the relationship between Sullivan and Wright; even Wright later told two different versions of the occurrence. In An Autobiography, Wright claimed that he was unaware that his side ventures were a breach of his contract. When Sullivan learned of them, he was angered and offended; he prohibited any further outside commissions and refused to issue Wright the deed to his Oak Park house until after he completed his five years. Wright could not bear the new hostility from his master and thought the situation was unjust. He "threw down [his] pencil and walked out of the Adler and Sullivan office never to return." Dankmar Adler, who was more sympathetic to Wright's actions, later sent him the deed. On the other hand, Wright told his Taliesin apprentices (as recorded by Edgar Tafel) that Sullivan fired him on the spot upon learning of the Harlan House. Tafel also accounted that Wright had Cecil Corwin sign several of the bootleg jobs, indicating that Wright was aware of their illegal nature. Regardless of the correct series of events, Wright and Sullivan did not meet or speak for twelve years. After leaving Louis Sullivan's firm, Wright established his own practice on the top floor of the Sullivan designed Schiller Building (1892, demolished 1961) on Randolph Street in Chicago. Wright chose to locate his office in the building because the tower location reminded him of the office of Adler & Sullivan. Although Cecil Corwin followed Wright and set up his architecture practice in the same office, the two worked independently and did not consider themselves partners. Within a year, Corwin decided that he did not enjoy architecture and journeyed east to find a new profession. With Corwin gone, Wright moved out of the Schiller Building and into the nearby and newly completed Steinway Hall Building. The loft space was shared with Robert C. Spencer, Jr., Myron Hunt, and Dwight H. Perkins. These young architects, inspired by the Arts and Crafts Movement and the philosophies of Louis Sullivan, formed what would become known as the Prairie School. They were joined by Perkins apprentice, Marion Mahony, who in 1895 transferred to Wright's team of drafters and took over production of his presentation drawings and watercolor renderings. Mahony, the third woman to be licensed as an architect in Illinois and one of the first licensed female architects in the U.S., also designed furniture, leaded glass windows, and light fixtures, among other features, for Wright's houses. Between 1894 and the early 1910s, several other leading Prairie School architects and many of Wright's future employees launched their careers in the offices of Steinway Hall. Wright's projects during this period followed two basic models. 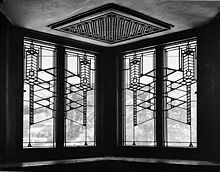 On one hand, there was his first independent commission, the Winslow House, which combined Sullivanesque ornamentation with the emphasis on simple geometry and horizontal lines that is typical in Wright houses. The Francis Apartments (1895, demolished 1971), Heller House (1896), Rollin Furbeck House (1897), and Husser House (1899, demolished 1926) were designed in the same mode. For more conservative clients, Wright conceded to design more traditional dwellings. These included the Dutch Colonial Revival style Bagley House (1894), Tudor Revival style Moore House I (1895), and Queen Anne style Charles E. Roberts House (1896). As an emerging architect, Wright could not afford to turn down clients over disagreements in taste, but even his most conservative designs retained simplified massing and occasional Sullivan inspired details. Soon after the completion of the Winslow House in 1894, Edward Waller, a friend and former client, invited Wright to meet Chicago architect and planner Daniel Burnham. Burnham had been impressed by the Winslow House and other examples of Wright's work; he offered to finance a four-year education at the École des Beaux-Arts and two years in Rome. To top it off, Wright would have a position in Burnham's firm upon his return. In spite of guaranteed success and support of his family, Wright declined the offer. Burnham, who had directed the classical design of the World's Columbian Exposition was a major proponent of the Beaux Arts movement, thought that Wright was making a foolish mistake. Yet for Wright, the classical education of the École lacked creativity and was altogether at odds with his vision of modern American architecture. Wright relocated his practice to his home in 1898 in order to bring his work and family lives closer. This move made further sense as the majority of the architect's projects at that time were in Oak Park or neighboring River Forest. The past five years had seen the birth of three more children — Catherine in 1894, David in 1895, and Frances in 1898 — prompting Wright to sacrifice his original home studio space for additional bedrooms. Thus, moving his work space necessitated his design and construction of an expansive studio addition to the north of the main house. The space, which included a hanging balcony within the two story drafting room, was one of Wright's first experiments with innovative structure. The studio was a poster for Wright's developing aesthetics and would become the laboratory from which the next ten years of architectural creations would emerge. The renovation included a playroom with high vaulted ceilings for his children. The fireplace takes up the majority of one wall of the playroom. A skylight at the top of the arc runs almost the length of the room. Made of Roman brick, the fireplace lies below a mural from the story "The Fisherman and the Genie" from Arabian Nights created by the artist Charles Corwin. Wright believed that the fireplace was an integral architectural feature within the home, often calling the hearth the heart of the home. "William Eugene Drummond, Francis Barry Byrne, Walter Burley Griffin, Albert Chase McArthur, Marion Mahony, Isabel Roberts and George Willis were the draftsmen. Five men, two women. They wore flowing ties, and smocks suitable to the realm. The men wore their hair like Papa, all except Albert, he didn't have enough hair. They worshiped Papa! Papa liked them! I know that each one of them was then making valuable contributions to the pioneering of the modern American architecture for which my father gets the full glory, headaches and recognition today!" Between 1900 and 1901, Frank Lloyd Wright completed four houses which have since been identified as the onset of the "Prairie style". Two, the Hickox and Bradley Houses, were the last transitional step between Wright's early designs and the Prairie creations. Meanwhile, the Thomas House and Willits House received recognition as the first mature examples of the new style. At the same time, Wright gave his new ideas for the American house widespread awareness through two publications in the Ladies' Home Journal. The articles were in response to an invitation from the president of Curtis Publishing Company, Edward Bok, as part of a project to improve modern house design. Bok also extended the offer to other architects, but Wright was the sole responder. "A Home in a Prairie Town" and "A Small House with Lots of Room in it" appeared respectively in the February and July 1901 issues of the journal. Although neither of the affordable house plans were ever constructed, Wright received increased requests for similar designs in following years. Wright's residential designs were known as "prairie houses" because the designs complemented the land around Chicago. These houses featured extended low buildings with shallow, sloping roofs, clean sky lines, suppressed chimneys, overhangs and terraces all using unfinished materials. The houses are credited with being the first examples of the "open plan". Windows whenever possible are long, and low, allowing a connection between the interior and nature, outside, that was new to western architecture and reflected the influence of Japanese architecture on Wright. The manipulation of interior space in residential and public buildings are hallmarks of his style. Public buildings in the Prairie style include Unity Temple, the home of the Unitarian Universalist congregation in Oak Park. As a lifelong Unitarian and member of Unity Temple, Wright offered his services to the congregation after their church burned down in 1905. The community agreed to hire him and he worked on the building from 1905 to 1909. Wright later said that Unity Temple was the edifice in which he ceased to be an architect of structure, and became an architect of space. Many architects consider it the world's first modern building, because of its unique construction of only one material: reinforced concrete. This would become a hallmark of the modernists who followed Wright, such as Mies van der Rohe, and even some post-modernists, such as Frank Gehry. Many examples of this work are in Buffalo, New York as a result of a friendship between Wright and Darwin D. Martin, an executive of the Larkin Soap Company. In 1902, the Larkin Company decided to build a new administration building. Wright came to Buffalo and designed not only the Larkin Administration Building (completed in 1904, demolished in 1950), but also homes for three of the company's executives including the Darwin D. Martin House in 1904, and later, their summer residence, the Graycliff Estate, also designed for Darwin D. Martin and his wife, Isabelle. Other Wright houses considered to be masterpieces of the late Prairie Period (1907–2000) are the Frederick Robie House in Chicago and the Avery and Queene Coonley House in Riverside, Illinois. The Robie House, with its soaring, cantilevered roof lines, supported by a 110-foot-long (34 m) channel of steel, is the most dramatic. Its living and dining areas form virtually one uninterrupted space. This building had a profound influence on young European architects after World War I and is sometimes called the "cornerstone of modernism". However, Wright's work was not known to European architects until the publication of the Wasmuth Portfolio. Local gossips noticed Wright's flirtations, and he developed a reputation in Oak Park as a man-about-town. His family had grown to six children, but Wright was not paternal and he relied on his wife Catherine to care for them. 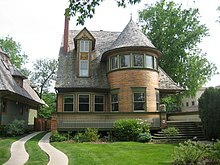 In 1903, Wright designed a house for Edwin Cheney, a neighbor in Oak Park, and immediately took a liking to Cheney's wife, Mamah Borthwick Cheney. Mamah Cheney was a modern woman with interests outside the home. She was an early feminist and Wright viewed her as his intellectual equal. The two fell in love, and they became the talk of the town, as they often could be seen taking rides in Wright's automobile through Oak Park. Wright's wife, Kitty, sure that this attachment would fade as the others had, refused to grant him a divorce. Mamah had to live in Europe for two years in order to obtain a divorce from Edwin on the grounds of desertion. In 1909, even before the Robie House was completed, Wright and Mamah Cheney went together to Europe, leaving their own spouses and children behind. By this point Wright "rejected" the Prairie Style single-family house model of the upper-middle class, and hoped to work on more democratic architecture. He was not getting larger commissions for commercial or public buildings, which frustrated him. What drew Wright to Europe was the chance to publish a portfolio of his work with Berlin publisher Ernst Wasmuth. The resulting two volumes, titled Studies and Executed Buildings of Frank Lloyd Wright, were published in 1911 in two editions, creating the first major exposure of Wright's work in Europe. The work contained more than 100 lithographs of Wright's designs and was commonly known as the Wasmuth Portfolio. Wright remained in Europe for almost a year and set up home first in Florence, Italy — where he lived with his eldest son Lloyd — and later in Fiesole, Italy where he lived with Mamah. During this time, Edwin Cheney granted Mamah a divorce, though Kitty still refused to grant one to her husband. After Wright returned to the United States in October 1910, he persuaded his mother to buy land for him in Spring Green, Wisconsin. The land, bought on April 10, 1911, was adjacent to land held by his mother's family, the Lloyd-Joneses. Wright began to build himself a new home, which he called Taliesin, by May 1911. The recurring theme of Taliesin also came from his mother's side: Taliesin in Welsh mythology was a poet, magician, and priest. The family motto was Y Gwir yn Erbyn y Byd which means "The Truth Against the World"; it was created by Iolo Morgannwg who also had a son called Taliesin, and the motto is still used today as the cry of the druids and chief bard of the Eisteddfod in Wales. On August 15, 1914, while Wright was working in Chicago, Julian Carlton, a male servant from Barbados who had been hired several months earlier, set fire to the living quarters of Taliesin and murdered seven people with an axe as the fire burned. The dead included Mamah; her two children, John and Martha; a gardener; a draftsman named Emil Brodelle; a workman; and another workman's son. Two people survived the mayhem, one of whom, William Weston, helped to put out the fire that almost completely consumed the residential wing of the house. Carlton swallowed hydrochloric acid immediately following the attack in an attempt to kill himself. He was nearly lynched on the spot, but was taken to the Dodgeville jail. Carlton died from starvation seven weeks after the attack, despite medical attention. In 1922, Kitty Wright finally granted Wright a divorce. Under the terms of the divorce, Wright was required to wait one year before he could marry his then-partner, Maude "Miriam" Noel. In 1923, Wright's mother, Anna (Lloyd Jones) Wright, died. Wright wed Miriam Noel in November 1923, but her addiction to morphine led to the failure of the marriage in less than one year. In 1924, after the separation but while still married, Wright met Olga (Olgivanna) Lazovich Hinzenburg at a Petrograd Ballet performance in Chicago. They moved in together at Taliesin in 1925, and soon Olgivanna was pregnant with their daughter, Iovanna, born on December 2, 1925. On April 20, 1925, another fire destroyed the bungalow at Taliesin. Crossed wires from a newly installed telephone system were deemed to be responsible for the blaze, which destroyed a collection of Japanese prints that Wright estimated to be worth $250,000 to $500,000. Wright rebuilt the living quarters, naming the home "Taliesin III". In 1926, Olga's ex-husband, Vlademar Hinzenburg, sought custody of his daughter, Svetlana. In October 1926, Wright and Olgivanna were accused of violating the Mann Act and arrested in Tonka Bay, Minnesota. The charges were later dropped. During this period, Wright designed Graycliff (1926–31), the summer estate of Isabelle and Darwin D. Martin. Wright and Miriam Noel's divorce was finalized in 1927, and once again, Wright was required to wait for one year before remarrying. Wright and Olgivanna married in 1928. In the 1920s, Wright designed a number of houses in California using precast "textile" concrete blocks reinforced by an internal system of bars. Wright first used his textile block system on the John Storer House in Hollywood, California, in 1923. The house is now used in films, television, and print media to represent the future. Typically Wrightian is the joining of the structure to its site by a series of terraces that reach out into and reorder the landscape, making it an integral part of the architect's vision. According to Wright's organic theory, all components of the building should appear unified, as though they belong together. Nothing should be attached to it without considering the effect on the whole. To unify the house to its site, Wright often used large expanses of glass to blur the boundary between the indoors and outdoors. With the Ennis House and the Samuel Freeman House (both 1923), Wright had further opportunities to test the limits of the textile block system. He also designed a textile block house for Aline Barnsdall, the Community Playhouse ("Little Dipper"), which was never constructed. Wright's son, Lloyd Wright, supervised construction for the Storer, Freeman and Ennis Houses. Architectural historian Thomas Hines has suggested that Lloyd's contribution to these projects is often overlooked. During the later 1920s and 1930s Wright's Organic style had fully matured with the design of Graycliff, Fallingwater and Taliesin West. Graycliff, located just south of Buffalo, NY is an important mid-career (1926–1931) design by Wright; it is a summer estate designed for his long-time patrons, Isabelle and Darwin D. Martin. Created in Wright's high Organic style, Wright wrote in a letter to the Martins that "Coming in the house would be something like putting on your hat and going outdoors." 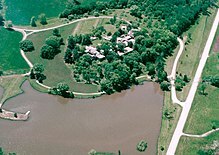 Graycliff consists of three buildings set within 8.5 acres of landscape, also designed by Wright. Its site, high on a bluff overlooking Lake Erie, inspired Wright to create a home that was transparent, with views through the building to the lake beyond. Terraces and cantilevered balconies also encourage lake views, and water features throughout the landscape were designed by Wright to echo the lake as well. One of Wright's most famous private residences was built from 1934 to 1937—Fallingwater—for Mr. and Mrs. Edgar J. Kaufmann Sr., at Mill Run, Pennsylvania, near Pittsburgh. It was designed according to Wright's desire to place the occupants close to the natural surroundings, with a stream and waterfall running under part of the building. Wright wanted the new residents to live with the waterfalls, to make them part of their everyday lives. He didn't want them to just look at them every now and again. Constructed over a 30-foot waterfall, the house may look very big on the outside but on the inside it is quite small, which surprises some visitors. It was made with three bedrooms, a massive living room and a dining room. The house was more of a design for a family getaway, not for a live-in family. The construction is a series of cantilevered balconies and terraces, using limestone for all verticals and concrete for the horizontals. The house cost $155,000, including the architect's fee of $8,000. It was one of Wright's most expensive pieces. Kaufmann's own engineers argued that the design was not sound. They were overruled by Wright, but the contractor secretly added extra steel to the horizontal concrete elements. In 1994, Robert Silman and Associates examined the building and developed a plan to restore the structure. In the late 1990s, steel supports were added under the lowest cantilever until a detailed structural analysis could be done. In March 2002, post-tensioning of the lowest terrace was completed. Taliesin West, Wright's winter home and studio complex in Scottsdale, Arizona, was a laboratory for Wright from 1937 to his death in 1959. Now the home of the Frank Lloyd Wright Foundation and archives, it continues today as the site of the Frank Lloyd Wright School of Architecture. Wright is responsible for a series of concepts of suburban development united under the term Broadacre City. He proposed the idea in his book The Disappearing City in 1932, and unveiled a ទំព័រគំរូ:Convert/ft2 model of this community of the future, showing it in several venues in the following years. He continued developing the idea until his death. Concurrent with the development of Broadacre City, also referred to as Usonia, Wright conceived a new type of dwelling that came to be known as the Usonian House. An early version of the form can be seen in the Malcolm Willey House (1934) in Minneapolis; but the Usonian ideal emerged most completely in the Herbert and Katherine Jacobs First House (1937) in Madison, Wisconsin. Designed on a gridded concrete slab that integrated the house's radiant heating system, the house featured new approaches to construction, including sandwich walls that consisted of layers of wood siding, plywood cores and building paper, a significant change from typically framed walls. Usonian houses most commonly featured flat roofs and were mostly constructed without basements, completing the excision of attics and basements from houses, a feat Wright had been attempting since the early 20th century. The Jacobses also commissioned the "Solar Hemicycle" by Wright in 1944, a seminal project in the solar house movement. Intended to be highly practical houses for middle-class clients, and designed to be run without servants, Usonian houses often featured small kitchens — called "workspaces" by Wright — that adjoined the dining spaces. These spaces in turn flowed into the main living areas, which also were characteristically outfitted with built-in seating and tables. As in the Prairie Houses, Usonian living areas focused on the fireplace. Bedrooms were typically isolated and relatively small, encouraging the family to gather in the main living areas. The conception of spaces instead of rooms was a development of the Prairie ideal; as the built-in furnishings related to the Arts and Crafts principles from which Wright's early works grew. Spatially and in terms of their construction, the Usonian houses represented a new model for independent living, and allowed dozens of clients to live in a Wright-designed house at relatively low cost. The diversity of the Usonian ideal can be seen in houses such as the Gregor S. and Elizabeth B. Affleck House (1941) in Bloomfield Hills, Michigan, which projects over a ravine; and the Hanna-Honeycomb House (1937) in Palo Alto, California, which features a honeycomb planning grid. Gordon House, completed in 1963, was Wright's last Usonian design. Fewer than 60 of Wright's Usonian houses were built. His Usonian homes set a new style for suburban design that was a feature of countless developers. Many features of modern American homes date back to Wright, including open plans, slab-on-grade foundations, and simplified construction techniques that allowed more mechanization and efficiency in building. Some of the built-in furniture remains, while other restorations have included replacement pieces created using his plans. His Prairie houses use themed, coordinated design elements (often based on plant forms) that are repeated in windows, carpets and other fittings. He made innovative use of new building materials such as precast concrete blocks, glass bricks and zinc cames (instead of the traditional lead) for his leadlight windows, and he famously used Pyrex glass tubing as a major element in the Johnson Wax Headquarters. Wright was also one of the first architects to design and install custom-made electric light fittings, including some of the very first electric floor lamps, and his very early use of the then-novel spherical glass lampshade (a design previously not possible due to the physical restrictions of gas lighting). As Wright's career progressed, so did the mechanization of the glass industry. Wright fully embraced glass in his designs and found that it fit well into his philosophy of organic architecture. Glass allowed for interaction and viewing of the outdoors while still protecting from the elements. In 1928, Wright wrote an essay on glass in which he compared it to the mirrors of nature: lakes, rivers and ponds. One of Wright's earliest uses of glass in his works was to string panes of glass along whole walls in an attempt to create light screens to join together solid walls. By utilizing this large amount of glass, Wright sought to achieve a balance between the lightness and airiness of the glass and the solid, hard walls. Arguably, Wright's best-known art glass is that of the Prairie style. The simple geometric shapes that yield to very ornate and intricate windows represent some of the most integral ornamentation of his career. Wright responded to the transformation of domestic life that occurred at the turn of the 20th century, when servants became less prominent or completely absent from most American households, by developing homes with progressively more open plans. This allowed the woman of the house to work in her 'workspace', as he often called the kitchen, yet keep track of and be available for the children and/or guests in the dining room. Much of modern architecture, including the early work of Mies van der Rohe, can be traced back to Wright's innovative work. Wright also designed some of his own clothing. His fashion sense was unique and he usually wore expensive suits, flowing neckties, and capes. He had a fascination with automobiles, purchasing his first car in 1909, a Stoddard-Dayton roadster, and owned many exotic vehicles over the years. During the cash-strapped Depression, Wright drove cheaper vehicles. Some of his last cars in the 1950s included four Volkswagens and a Chevrolet Nomad wagon along with flashier articles such as a Jaguar Mark VII. He owned some 50 cars between 1909 and his death, of which ten are known to be extant. Wright strongly believed in individualism and did not affiliate with the American Institute of Architects during his career, going so far as to call the organization "a harbor of refuge for the incompetent," and "a form of refined gangsterism." When an associate referred to him as "an old amateur" Wright confirmed, "I am the oldest." Wright turned 80 shortly after WWII ended, yet remained busy as ever. The Solomon R. Guggenheim Museum in New York City occupied Wright for 16 years (1943–1959) and is probably his most recognized masterpiece. The building rises as a warm beige spiral from its site on Fifth Avenue; its interior is similar to the inside of a seashell. Its unique central geometry was meant to allow visitors to easily experience Guggenheim's collection of nonobjective geometric paintings by taking an elevator to the top level and then viewing artworks by walking down the slowly descending, central spiral ramp, the floor of which is embedded with circular shapes and triangular light fixtures to complement the geometric nature of the structure. However, when the museum was completed, a number of details of Wright's design were ignored, such as his desire for the interior to be painted off-white. Further, the Museum currently designs exhibits to be viewed by walking up the curved walkway rather than walking down from the top level. The only realized skyscraper designed by Wright is the Price Tower, a 19-story tower in Bartlesville, Oklahoma. It is also one of the two existing vertically oriented Wright structures (the other is the S.C. Johnson Wax Research Tower in Racine, Wisconsin). The Price Tower was commissioned by Harold C. Price of the H. C. Price Company, a local oil pipeline and chemical firm. It opened to the public in February 1956. On March 29, 2007, Price Tower was designated a National Historic Landmark by the United States Department of the Interior, one of only 20 such properties in the state of Oklahoma. Wright designed over 400 built structures of which about 300 survive កាលពី 2005[update]. Four have been lost to forces of nature: the waterfront house for W. L. Fuller in Pass Christian, Mississippi, destroyed by Hurricane Camille in August 1969; the Louis Sullivan Bungalow of Ocean Springs, Mississippi, destroyed by Hurricane Katrina in 2005; and the Arinobu Fukuhara House (1918) in Hakone, Japan, destroyed in the 1923 Great Kantō earthquake. The Ennis House in California has also been damaged by earthquake and rain-induced ground movement. In January 2006, the Wilbur Wynant House in Gary, Indiana was destroyed by fire. In addition, other buildings were intentionally demolished during and after Wright's lifetime, such as: Midway Gardens (1913, Chicago, Illinois) and the Larkin Administration Building (1903, Buffalo, New York) were destroyed in 1929 and 1950 respectively; the Francis Apartments and Francisco Terrace Apartments (both located in Chicago and designed in 1895) were destroyed in 1971 and 1974, respectively; the Geneva Inn (1911) in Lake Geneva, Wisconsin was destroyed in 1970; and the Banff National Park Pavilion (1911) in Alberta, Canada was destroyed in 1939. 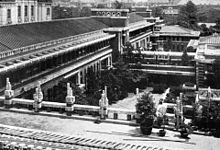 The Imperial Hotel, in Tokyo (1913) survived the Great Kantō earthquake but was demolished in 1968 due to urban developmental pressures. One of his projects, Monona Terrace, originally designed in 1937 as municipal offices for Madison, Wisconsin, was completed in 1997 on the original site, using a variation of Wright's final design for the exterior with the interior design altered by its new purpose as a convention center. The "as-built" design was carried out by Wright's apprentice Tony Puttnam. Monona Terrace was accompanied by controversy throughout the 60 years between the original design and the completion of the structure. Florida Southern College, located in Lakeland, Florida, constructed 12 (out of 18 planned) Frank Lloyd Wright buildings between 1941 and 1958 as part of the Child of the Sun project. It is the world's largest single-site collection of Frank Lloyd Wright architecture. A lesser known project that never came to fruition was Wright's plan for Emerald Bay, Lake Tahoe. Few Tahoe locals know of the iconic American architect's plan for their natural treasure. A house design that Wright completed shortly before his death in 1959 was realized in late 2007 in the Republic of Ireland. The Kalita Humphreys Theater in Dallas, Texas was Wright's final project before his death. Frank Lloyd Wright was interested in site and community planning throughout his career. His commissions and theories on urban design began as early as 1900 and continued until his death. He had 41 commissions on the scale of community planning or urban design. His thoughts on suburban design started in 1900 with a proposed subdivision layout for Charles E. Roberts entitled the "Quadruple Block Plan." This design strayed from traditional suburban lot layouts and set houses on small square blocks of four equal-sized lots surrounded on all sides by roads instead of straight rows of houses on parallel streets. The houses, which used the same design as published in "A Home in a Prairie Town" from the Ladies' Home Journal, were set toward the center of the block to maximize the yard space and included private space in the center. This also allowed for far more interesting views from each house. Although this plan was never realized, Wright published the design in the Wasmuth Portfolio in 1910. The more ambitious designs of entire communities were exemplified by his entry into the City Club of Chicago Land Development Competition in 1913. The contest was for the development of a suburban quarter section. This design expanded on the Quadruple Block Plan and included several social levels. The design shows the placement of the upscale homes in the most desirable areas and the blue collar homes and apartments separated by parks and common spaces. The design also included all the amenities of a small city: schools, museums, markets, etc. This view of decentralization was later reinforced by theoretical Broadacre City design. The philosophy behind his community planning was decentralization. The new development must be away from the cities. In this decentralized America, all services and facilities could coexist "factories side by side with farm and home." Though most famous as an architect, Wright was an active dealer in Japanese art, primarily ukiyo-e woodblock prints. He frequently served as both architect and art dealer to the same clients; he designed a home, then provided the art to fill it. For a time, Wright made more from selling art than from his work as an architect. Wright was also an avid collector of Japanese prints and used them as teaching aids with his apprentices in what were called "print parties". Wright first traveled to Japan in 1905, where he bought hundreds of prints. The following year, he helped organize the world's first retrospective exhibition of works by Hiroshige, held at the Art Institute of Chicago. For many years, he was a major presence in the Japanese art world, selling a great number of works to prominent collectors such as John Spaulding of Boston, and to prominent museums such as the Metropolitan Museum of Art in New York. He penned a book on Japanese art in 1912. In 1920, however, rival art dealers began to spread rumors that Wright was selling retouched prints; this combined with Wright's tendency to live beyond his means, and other factors, led to great financial troubles for the architect. Though he provided his clients with genuine prints as replacements for those he was accused of retouching, this marked the end of the high point of his career as an art dealer. He was forced to sell off much of his art collection in 1927 to pay off outstanding debts; the Bank of Wisconsin claimed his Taliesin home the following year, and sold thousands of his prints, for only one dollar a piece, to collector Edward Burr Van Vleck. Wright continued to collect and deal in prints until his death in 1959, using prints as collateral for loans, often relying upon his art business to remain financially solvent. The extent of his dealings in Japanese art went largely unknown, or underestimated, among art historians for decades until, in 1980, Julia Meech, then associate curator of Japanese art at the Metropolitan Museum, began researching the history of the museum's collection of Japanese prints. She discovered "a three-inch-deep 'clump of 400 cards' from 1918, each listing a print bought from the same seller—'F. L. Wright'" and a number of letters exchanged between Wright and the museum's first curator of Far Eastern Art, Sigisbert C. Bosch Reitz, in 1918-22. These discoveries, and subsequent research, led to a renewed understanding of Wright's career as an art dealer. Turmoil followed Wright even many years after his death on April 9, 1959, shortly after undergoing surgery in Phoenix, Arizona, to remove an intestinal obstruction. After the death of his third wife, Olgivanna in 1985, it was learned that her dying wish had been that Wright, she, and her daughter by her first marriage all be cremated and interred together in a memorial garden being built at Taliesin West. By then, and according to his own wishes, Wright's body had lain for over 25 years in the Lloyd-Jones cemetery, next to the Unity Chapel, near Taliesin, Wright's beloved home in Spring Green, Wisconsin. Although Olgivanna had taken no legal steps to move Wright's remains and against the wishes of other family members as well as the Wisconsin legislature, Wright's remains were removed from his grave by members of the Taliesin Fellowship, cremated and sent to Scottsdale where they were later interred in the memorial garden. Today, the original gravesite in Wisconsin, while empty, is still marked with Wright's name. He also routinely claimed the architects and architectural designers who were his employees' work as his own design and claimed that the rest of the Prairie School architects were merely his followers, imitators and subordinates. But, as with any architect, Wright worked in a collaborative process and drew his ideas from the work of others. In his earlier days, Wright worked with some of the top architects of the Chicago School, including Sullivan. In his Prairie School days, Wright's office was populated by many talented architects including William Eugene Drummond, John Van Bergen, Isabel Roberts, Francis Barry Byrne, Albert McArthur, Marion Mahony Griffin and Walter Burley Griffin. The Czech-born architect Antonin Raymond, recognized as the father of modern architecture in Japan, worked for Wright at Taliesin and led the construction of the Imperial Hotel in Tokyo. He subsequently stayed in Japan and opened his own practice. Rudolf Schindler also worked for Wright on the Imperial hotel. His own work is often credited as influencing Wright's Usonian houses. Schindler's friend Richard Neutra also worked briefly for Wright and became an internationally successful architect. Later in the Taliesin days, Wright employed many architects and artists who later become notable, such as Aaron Green, John Lautner, E. Fay Jones, Henry Klumb and Paolo Soleri in architecture and Santiago Martinez Delgado in the arts. As a young man, actor Anthony Quinn applied to study with Wright at Taliesin. However, Wright suggested that he first take voice lessons to help overcome a speech impediment. Bruce Goff never worked for Wright but maintained correspondence with him. Their works can be seen to parallel each other. Simon & Garfunkel recorded So Long, Frank Lloyd Wright as a tribute to Wright. Later in his life and well after his death in 1959, Wright received much honorary recognition for his lifetime achievements. He received Gold Medal awards from The Royal Institute of British Architects (RIBA) in 1941 and the American Institute of Architects (AIA Gold Medal) in 1949. The medal was a symbolic "burying the hatchet" between Wright and the AIA. In a radio interview he commented, "Well, the AIA I never joined, and they know why. When they gave me the gold medal in Houston, I told them frankly why. Feeling that the architecture profession is all that's the matter with architecture, why should I join them?" He was awarded the Franklin Institute's Frank P. Brown Medal in 1953. He received honorary degrees from several universities (including his "alma mater", the University of Wisconsin) and several nations named him as an honorary board member to their national academies of art and/or architecture. In 2000, Fallingwater was named "The Building of the 20th century" in an unscientific "Top-Ten" poll taken by members attending the AIA annual convention in Philadelphia. On that list, Wright was listed along with many of the USA's other greatest architects including Eero Saarinen, I.M. Pei, Louis Kahn, Philip Johnson and Ludwig Mies van der Rohe, and he was the only architect who had more than one building on the list. The other three buildings were the Guggenheim Museum, the Frederick C. Robie House and the Johnson Wax Building. In 1992, the Madison Opera in Madison, Wisconsin commissioned and premiered the opera Shining Brow, by composer Daron Hagen and librettist Paul Muldoon based on events early in Wright's life. The work has since received numerous revivals, including a June 2013 revival at Fallingwater, in Bull Run, Pennsylvania, by Opera Theater of Pittsburgh. 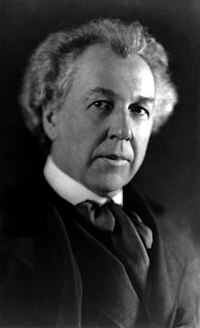 In 2000, Work Song: Three Views of Frank Lloyd Wright, a play based on the relationship between the personal and working aspects of Wright's life, debuted at the Milwaukee Repertory Theater. In 1966, the United States Postal Service honored Wright with a Prominent Americans series 2¢ postage stamp. Several of Wright's buildings have been proposed by the United States to be UNESCO World Heritage sites. In 1957, Arizona made plans to construct a new Capitol building. Believing that the submitted plans for the new Capitol were tombs to the past, Frank Lloyd Wright offered an alternative to the people of Arizona. Wright felt that Arizona's Capitol should inspire the citizens to loftier heights. Wright's architectural dream of the Oasis captures the spirit of his vision - an oasis from the heat of the desert, an oasis from the mediocrity of our past decisions, an oasis for open government and unconstrained ideas. This collection also includes an early version of the Oasis with three spires, a typewritten transcript where Wright expresses his opinions regarding the various plans for Arizona's Capitol Building, and images of the restoration work completed by Kenneth C. Truong. In 2004, one of the spires included in his design was erected in his memory. Consisting of roughly 1,700 individual pieces of steel, the Frank Lloyd Wright Spire is visible from nearly everywhere in residential Scottsdale and illuminates the night sky with a stunning, futuristic architectural ambiance of teal and blue. Frank Lloyd Wright was married three times and fathered seven children, four sons and three daughters. He also adopted Svetlana Milanoff, the daughter of his third wife, Olgivanna Lloyd Wright. One of Wright's sons, Frank Lloyd Wright, Jr., known as Lloyd Wright, was also a notable architect in Los Angeles. Lloyd Wright's son (and Wright's grandson), Eric Lloyd Wright, is currently an architect in Malibu, California where he has a practice of mostly residences, but also civic and commercial buildings. Another son and architect, John Lloyd Wright, invented Lincoln Logs in 1918, and practiced extensively in the San Diego area. John's daughter, Elizabeth Wright Ingraham, was an architect in Colorado Springs, Colorado, and died September 15, 2013, of congestive heart failure. She is the mother of Christine, an interior designer in Connecticut, and Catherine, an architecture professor at the Pratt Institute. Wright designed a house for David Samuel Wright, his son by his first marriage to Catherine, and David's wife, Gladys. The Oscar-winning actress Anne Baxter was Wright's granddaughter. Baxter was the daughter of Catherine Baxter, a child born of Wright's first marriage. Baxter's daughter, Melissa Galt, currently lives and works in Atlanta as an interior designer. His step-daughter Svetlana (daughter of Olgivanna) and her son Daniel died in an automobile accident in 1946. Her widower, William Wesley Peters, was later briefly married to Svetlana Alliluyeva, the youngest child and only daughter of Joseph Stalin. They divorced after she could not adjust to the communal lifestyle of the Wright communities, which she compared to life in the Soviet Union under her father, and because of the constant interference of Wright's widow. Peters served as Chairman of the Frank Lloyd Wright Foundation from 1985 to 1991. A great-grandson of Wright, S. Lloyd Natof, currently lives and works in Chicago as a master woodworker who specializes in the design and creation of custom wood furniture. From Wright’s death in 1959 most of his collections were stored at the headquarters of the Frank Lloyd Wright Foundation — Taliesin, in Spring Green, Wisconsin, and Taliesin West. The collection includes more than 23,000 architectural drawings, about 40 large-scale architectural models, some 44,000 photographs, 600 manuscripts and more than 300,000 pieces of office and personal correspondence. The archive’s architectural models include notable Wright projects like the unrealized St. Mark’s Tower and a version of the Guggenheim. Most of these models were not made for clients; they were constructed for MoMA’s retrospective of Wright in 1940. In order to guarantee a high level of conservation and access as well as to transfer the considerable financial burden of maintaining the archive, the Frank Lloyd Wright Foundation in 2012 partnered with the Museum of Modern Art and the Avery Architectural and Fine Arts Library to move the archive to New York. Wright’s furniture and art collection remain with the foundation, which will also have a role in monitoring the archive. Together the three parties established an advisory group to oversee exhibitions, symposiums, events and publications. Photographs and other archival materials are held by the Ryerson & Burnham Libraries at the Art Institute of Chicago. The Herbert and Katherine Jacobs Residence and Frank Lloyd Wright Records, 1924–1974, Collection includes drawings, correspondence, and other materials documenting the construction of two homes for the Jacobs as well as research files on Wright's life. The Frank Lloyd Wright in Michigan Collection, 1945–1988, consists of research documents, including photocopied correspondence between Wright and his clients, used for the book "Frank Lloyd Wright in Michigan." The Wrightiana Collection, c. 1897–1997 (bulk 1949–1969), includes a variety of printed materials and photographs about Wright and his projects. The Joseph J. Bagley Cottage Collection, c. 1916–1925, contains photographs and drawings documenting the Bagley cottage which was completed in 1916. The architect's personal archives are located at Taliesin West in Scottsdale, Arizona. The Frank Lloyd Wright archives include photographs of his drawings, indexed correspondence beginning in the 1880s and continuing through Wright's life, and other ephemera. The Getty Research Center in Los Angeles, also has copies of Wright's correspondence and photographs of his drawings in their "Frank Lloyd Wright Special Collection". Wright's correspondence is indexed in An Index to the Taliesin Correspondence, ed. by Professor Anthony Alofsin, which is available at larger libraries. ↑ Frank Lloyd Wright Preservation Trust 2001, pp. 6–9. ↑ Minnesota Historical Society, Collections Up Close, "Frank Lloyd Wright Arrested in Minnesota"
↑ Berstein, Fred A. "Near Nagoya, Architecture From When the East Looked West," New York Times. ↑ The Unity Chapel, designed by Joseph Silsbee, should not be confused with the much larger and vastly more famous Unity Temple, designed by Wright and located in Oak Park, Illinois. ↑ Frank Lloyd Wright: A Biography, Meryle Secrest, University of Chicago Press, 1992. ↑ ៨៧,០ ៨៧,១ Robin Pogrebin (September 3, 2012), A Vast Frank Lloyd Wright Archive Is Moving to New York New York Times. ↑ Robin Pogrebin (March 9, 2014), Models Preserve Wright’s Dreams New York Times. Russell, Virginia L. "You Dear Old Prima Donna: The Letters of Frank Lloyd Wright and Jens Jensen", Landscape Journal, 20.2 (2001): 141-155. Wright, Frank Lloyd. Frank Lloyd Wright: An Autobiography. New York: Duell, Sloan and Pearce, 1943. Wright, Frank Lloyd. The Natural House. New York: Horizon Press, 1954. Farr, Finis. Frank Lloyd Wright: A Biography. New York: Scribner, 1961. Wright, Iovanna Lloyd. Architecture: Man in Possession of His Earth. Garden City, NY: Doubleday, 1962. Blake, Peter. Frank Lloyd Wright: Architecture and Space. Baltimore, MD: Penguin Books, 1964.